Notes: Most of the interview was in English, apart from the following introduction, the translation of which follows. Norma Maldonado (NM): So all our work is related to the Association Agreement, megaprojects, transnational companies. We created a tribunal against the transnational companies during the Social Forum of the Americas. Today, before coming here, I was finishing off an article about the Social Forum which was in October. There are many things which we deal with which are related to the gender issue. The issue has remained a little outside the mainstream, and not because women wanted it so, but because the women have almost no say in managing the issue of the macro-economy. The woman is in the house. So the sphere of macroeconomics is a bit difficult, even for feminists. It’s a major effort to get the macro issue inserted into discussions about globalisation, transnationals, climate change. It’s a task in which we still have to self-educate ourselves, through training manuals on these issues. So this is a type of virtual training, using the internet for leaders who have a computer and who are in the city, and especially for community leaders. I work in the communities with a school of policy for indigenous women. The remainder is a transcription of the interview which was conducted in English. Alice Klein (AK): What are the problems with free trade agreements for Guatemala and for Central America? NM: In general, we see these trade agreements as a big imposition by the developed nations. When we were celebrating the derailment of the WTO in Cancún, for Central America it was the opposite because that’s when the United States deliberately negotiated by portions of the nations because the WTO negotiations were derailed. And so the big economic blocks launched trade bilateral agreements with the small nations. To give you an example, NAFTA, the trade agreement with North America, took four years of discussions, ten years with Chile. This negotiation with Central America took nine months and I think that the Dominican Republic took three months or something like that – ridiculous. So, for thousands and thousands of words – and everything discussed in English – not even the lawyers, the lawmakers in Congress knew what this was about – the business people. So for us, immediately, as soon as we knew it was a United States negotiation, we knew it was not good news. So it was easier to mobilise the people because everything that comes from the United States is a threat to us. Historically, it’s not something we made up; if you know the history of Guatemala, particularly in 1954 the United States, with the United Fruit Company, with the CIA, they orchestrated a coup and overthrew the government that lasted only ten years. So, after that we had a series of dictatorships and the killings and the history of blood that has cost the …. And overthrew the Arbenz government. And so it was because of this huge company, which now – I was just reading before I came here – as Chiquita brands has a lot to do with what happened in the coup in Honduras because Zelaya raised by 60 per cent the minimum wage. And so, who are the big employers there? Chiquita brands, Standard brands, the United Fruit Company – so they are directly involved, and so are the pharmaceuticals. So it’s not surprising to hear that the rules of big business are those the United States has imposed. So the trade agreement we knew … it was negotiated in secret. That means that it was not good. If it was good, it should have been public. We demonstrated for four months – there were people killed; Congress was surrounded by military – we couldn’t get close to Congress to deliver our petitions. We had over 25,000 signatures against the trade agreement. Constitutionally, we only need 5,000 to ask for a referendum. The head of Congress by then was Hebrucher, from a big oligarchic family. He said “even if you brought a million signatures the decision is already made.” After that decision was made, I had a memo that the organisations in the United States had sent us to the organisations here, where the government of the United States said what law should be changed here and there. They sent the memos of what had to be changed to modify the Constitution. And so the CAFTA is above our Constitution. There are so many articles modified; and so the secrecy, the fact that it comes from the United States, the history of imposition, the lack of information. So we needed to know that this was something of a trick to the majority. And that’s what it is. It’s nothing less than … You see, we already have trade with Europe. Everything that we need to be traded is already traded. We didn’t need any other thing. They needed the certainty, the legal certainty in certain issues, especially in the intellectual property rights – so they needed those things changed. I remember to tie this to the issue that interests you. The World Bank has financed the Mesoamerican Biological Corridor and only 2 per cent of that corridor has been exploited by companies, and that’s biotechnology. So this corridor has 98 per cent possibilities for business – that’s financial. So here we have the Plan Puebla Panama, the …, the CAFTA, the law. This was the legal …. And so they needed certain people for the things that they were going to start doing, especially in biotechnology – patents for plants. So that’s why we know they’re not here to trade with us. We’re sending everything that we have, so far. AK: Norma, with the Plan Puebla Panama when it was renamed, Mesoamerican Biological Corridor, when it was disbanded and renamed – is the Mesoamerican Biological Corridor still happening? AK: I was just going to ask what the specific effects have been of the free trade agreement with ALCA? NM: Well the immediate effects have been in the interests of companies on land, on soil, have led to the displacement of a lot of people in communities. You can see, especially where the real interests such as African Palm to the new matrix of energy have changed – the interests being in water, in territory and land for planting sugar cane; and so you see that [13:59] a lot of people come from that area, from the Kekchi Group. Tomorrow I’m going to Satapa where a friend of mine is being imprisoned and they’re giving him eight years for defending the territory. He was imprisoned because he lives by there, and there’s a woman from the oligarchy group who claims that he’s a threat. He’s been in prison – tomorrow he’s going to be a debate, and because of him the community captured seven Belgian – four Belgian tourists – I don’t know whether you heard that – last year in the Río Dulce area and the … ; and so the people are really angry; and so government works so that my friend has eight years. So maybe tomorrow they’re going to try to reach 30 years. So we’re going there tomorrow. Martin Mowforth (MM): Can I just very briefly explain why I chuckled and laughed a little bit, because we’ve just spent a couple of days with a Belgian delegation up in San Marcos and San Miguel Ixtahuacán. So when you said the Belgians were arrested – did you say? NM: They were kidnapped. They were taken by the campesinos in Río Dulce to press for the government. But instead the police came and they killed one of the persons and raided a friend of mine who’s doing this investigation, this paper that we’re doing. She was there because her husband is the one in prison – she was carrying my digital camera; they took everything that she had and she dropped some other stuff in the water. It was kind of like a big drama in 2008 last year. He’s been over a year now in prison. NM: Javier Choc. Check on the web because he’s the first political prisoner of this government because this government talks about they’re going to be for the poor, blah, blah, in a … speech. Then a month after they took my friend in prison. So he’s a political prisoner for defending the territory. Because he’s Kekchi. You see a lot of Kekchis working as security people, as policemen – private. They haven’t migrated like any other group to the United States or other places. They have travelled within the country, especially tours to Belize, but this group is now for the first time migrating to the city. You can see them, men and women, they don’t go to the United States because most of them are monolingual – they only speak Spanish, especially the women and men can pick it up. So, this is where the mining is, the oil is, the bioprospecting, this is where the water is. This is a very, very rich area, and that whole area is Kekchi. So that’s one of the first things I can tell. You know, the displacement, total displacement of communities, the migration, the buying or renting of land. You know, a lot of people, when they came back from the refugee camps, they were given land [18:10] around that area – you know, …. So now these people don’t have enough to feed or to work the land. A lot of the kids are half-Mexican, half- [silence]; a lot of them are back in Cancún. So a lot of these people are selling to these huge companies or renting soil for African palm. But African palm will destroy soil in 25 years. And they’re renting those lands for 25 years. That means that when they come back, it will be totally useless. And I’m in the process of making a documentary on that. We have a lot of footage already, trying to get the camera people and the people to work together and to script them. But we have lots of hours already collected from different seasons. So that’s been another way of – how do you get your land from the narco-people, the drug people? They put their money down – you know, I give you 10,000 for that. So you have to sell. But with this company, they know that the people are not working enough the land, because the kids are not working, because the value of the land. So they go and they say, we’ll rent; and also some of them work in those farms. Women work on the nursery of the African palms. They have a huge hall. I went to see – they can’t carry that physically – [19:51] they’re big transplants. So men do the hauling and women help in the nursery. So they have some income there but not enough for the whole year. So that’s another reason for the migration that is going to the United States. Men leaving the women to stay behind. Womens’ issues for example in Alta Verapaz where I work – only one per cent of women work in public offices – you’ve heard that in Chiapas there are Consejos Comunitarios de Desarrollo but only one per cent of women participate in those. But the issue of water is a women’s issue. In the documentary that we are doing, women are walking four hours to get buckets smaller than that because huge transnationals have already taken the water. And so a lot of the water streams are dry. [21:17] So they have to sell because they can’t handle this amount of energy [???] and a lot of the issues are not being even addressed in these Comités Comunitarios de Desarrollo – those issues directly affected are womens’ issues; and the women have to do the laundry, women have to do the cooking, washing the kids – entirely womens’ issues. So what we’re doing here, especially in the Alta Verapaz area where all this is happening, we’re doing the water collection systems – we’re building like one a day, by a house. It’s a cheap way of setting them – it’s very different from … [???] … there’s a big discussion about why, but if you see them, they’re not the largest group linguistically, but territorially they’re the largest. So of course if you’re going to have one [new] way of water, they would have to change their entire culture. We get them together so that they can have true running water. So, according to the culture what we do here is save the rainwater because there’s like 4,000 mm of water a year. It rains there ten months of the year – it rains and rains and rains. So that’s why the companies are there obviously. Of course there are many others that you will know about – you know, the trade agreement thing; good jobs for women – can’t go to the bathroom, don’t let them drink so they won’t go to the bathroom, the pregnancy test in the maquiladoras, and a lot of people come from the rural area to these huge free trade zones to be exploited, and they don’t have any voice [23:55] because this free capital … if you don’t give them the prices, if you don’t lower your prices, they go to the next one. A lot of them were going to Honduras. Honduras is the cheapest in the area, you know – nine cents for a collar, or something ridiculous like that. So that’s the threat constantly to the people. So you can’t organise; you don’t have any rights; you can’t accumulate anything; you can be fired any time; and the government doesn’t enforce anything. So when they say, “Oh no, we’re bringing development to the Third World”. And what kind? And at what cost? And for how long? You know we’re not going to have a country left. So that’s the way we approach trade agreements. We don’t think …. And also if you see the map of the world, this part of the world has from 3,500 to 5,000 species per sq km. In Europe because of climate, 200 per sq km. And the United States, just … So we’re destroying the planet. [25:41] We don’t want to be like the North – that’s too costly. We can’t afford to … globally, we can’t; we’re doing the work of protecting for the Third World, not only for us, but for Honduras. What’s happening there we can’t allow because for the vested interests. AK: While we’re talking about women and the water issue, maybe we can move onto that question because I was going to ask why free trade agreements like this affect women disproportionately; other than what you’ve said, are there any other reasons why women are particularly affected? NM: When you duplicate the work of women doing what you have to do daily, but now it’s even worse, when you don’t have the resources, obviously you’re not going to have anybody doing public office. You don’t have the energy. I live in communities with them, and I remember that I thought I was going to write a book. I couldn’t write anything. It’s so … work, just gathering wood, collecting water, washing. By the time you want to sit, it’s already late and you don’t have the energy to do any public office or … A lot of women have stopped going to organisations and getting organised … They have to deal with domestic [27:18] surviving with gathering food for the people. And this is happening not only in communities, but in rural areas where you see struggling women selling this – I know a woman who this morning I talked to – she brings something that she sells like … ??? … then she doesn’t have time to get to the meeting. Also the church, especially the Protestant church, has known about that, so when they can stop marketing they go to church. The people know they need to relax and music and dancing or something to let go. A lot of the help I get for this … and that’s what makes it so popular. But I think that the interest is – I’ve seen less and less women participating [28:32] in public office, in studying and other things and in developing other areas and events – just surviving and gathering for others, for the elderly and health. That’s why the big issue in Honduras is with the ALBA, they were going to have to make medicine for huge prices. The prices here for … are ridiculous. It’s 9 quetzales for a dose so you can cure your amoeba. So you’re going to go back to stew yourself a punch, which is a good thing though because the medicine is unaffordable. So is education. Education and health are unaffordable. There are so many people that I know in communities that have never seen a doctor other than a Cuban doctor that are helping. And so the Cubans have come and helped. The first doctor they’ve seen in their lives is a Cuban doctor. And so the medications are so expensive – it’s such a business – so that’s why the generic thing is a big issue for Honduras, and that’s what you see has happened to them – directly involved in that coup are the huge companies. AK: Norma, are you talking about anti-retroviral drugs which are patented like, say, that kind of medicine? NM: What’s really helped is Medecins Sans Frontières. They brought the anti-retrovirals for the people, but the government doesn’t have – I think the budget for Guatemala is something like 9 cents a year, so you can’t really have anything with that amount of money. I even went for my glasses to the Cuban doctors in Alta Verapaz, because they’re the best – the best examination I ever had for my eyes. I thought I was needing glasses because my mum is blind now. But we can’t afford surgery, let alone treatment. Glasses – people just go without them. AK: So was ALBA going to offer generic copies of patented drugs for cheaper? NM: Yes, with ALBA countries, Cuba sends generics and they exchange for other things with Honduras. And doctors too. Lots of doctors in Honduras, Cuban doctors here in Guatemala. In Cuba studying – and students of the University of Havana they come here and they study. A lot of help, a lot of scholarships to the students who go to Cuba. We get very expensive medicines here that are unaffordable. I have some medicines that I …?? ?… I get it from the States because I couldn’t afford it here. I have a family doctor there – she sends me the pamphlets for a few of the affordable … For the bones, for osteoporosis, there are over 100 types of pill. If you had a diet like I had, because I was the last child and my mum was malnourished. I have osteoporosis, and I couldn’t drink milk because we have lactose intolerance, and so I have very bad osteoporosis; but I can’t afford the medicine. My friends from the States send it in the mail. It’s too expensive. They don’t have generics, and if they don’t, with this law we can’t have those cheaper medicines. AK: With the free trade agreement with the European Union, what are the specific areas that you’re worried about? What particular sectors? 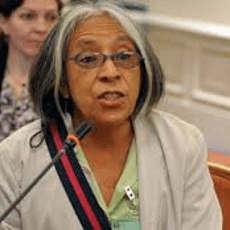 NM: More worried than any others than CAFTA? What difference? I was in Peru when Zapatero in Lima announced that there was going to be 1,500 million dollars on aid for water issues. And immediately Alan Garcia named his Minister of the Environment – he didn’t have one, so he named one during those days, and he was a German national who met with Merckel and then they decided they had 200 projects for water because they’re going to be doing this little Mickey Mouse water budget because they’re taking a huge chunk on this issue – so it’s a huge amount of money being set aside for this issue of people’s water. They’re doing foros, huge summits for water, things like that, because this is an issue, and these companies are actors. They’re not going to come – they’re already here, European companies – I think there are 72 companies already operating, and so we do expect that there will be more and more, from the biotechnology, huge companies, two water companies, two services, companies that are going to be in an area more and more. You see we’re one of the countries that exports more food in the world; for example we are the biggest exporters of broccoli in the world. 60 per cent of the food that Salvadorans eat is from Guatemala, from hortalizas, from vegetables, and 40 per cent of our fruit. We export to Mexico, to El Salvador, to Honduras, and to the European Union, we export to the United States, and we are one of the most malnourished countries in the hemisphere. So we’re already sending everything there. We compete with Haiti, Honduras and Bolivia for the worst victims of infant mortality and malnutrition in this country; and we are producers of food. Why is that? And in this little book I try to explain that. When Europe up to the middle of the Industrial Revolution was going into a lot of famine, corn helped, because at the beginning corn was fed only to animals to do manure to treat the soil. Corn has higher yields than other grains and gives a jump to the Industrial revolution in Europe because the soil was better off, feeding all the animals with corn. And now corn for oil, for ethanol; again corn is being used, and you know that for us corn is sacred, not just a food. For the Kekchi, 90 per cent of their diet is corn, and for them corn is food, gua – gua in Kekchi means food and means … For huge companies, for those interested in the ethanol, in Europe, that means our soul, our land and more of our basic food – what do you think is going to happen if you don’t have food produced in this country? [39:35] We have to import, but that’s what’s in the interests of these nations – that we become consumers, that the world consumes what they produce. Even if it’s genetically modified, the issue is they need consumers, people making money. But we don’t have jobs for these people – where are they going to go? To the United States? They’re building a wall there. Half of them die before getting there, so it’s a trap. What else? So that’s how we see this issue of so-called development – it’s a trap for daily life and for the people. It’s definitely not negotiable any more; it shouldn’t be mentioned any more; it’s ridiculous; it’s short-minded; it’s not sustainable. AK: That brings us to the next question, which is ‘What are the effects on urban and rural migration and poverty? To some extent you’ve already answered that, but is there anything you would like to add on what the effects of free trade agreements are on poverty in Guatemala? NM: Well, the United States and Europe are putting all these laws on migrants, horrible laws, which are xenophobia on Latinos and their treatment there. And people are coming on planes every day deported from … families are being separated; kids are being left; their parents are here daily; you see these drama; and nobody cares how they come; and they re-integrate; and they’re in debt; they leave their homes. That’s pushing people; it’s drying out people; entire communities. They need to come to the city, and what’s happening in the city is that 70 per cent of the work here is informal, in the informal sector. So you have all these people here doing the street-selling, anything, to the point that they raid the pirate discs off movies and things because of the copyrights. In El Salvador there have been huge raids against people who were selling the discs. All these issues that are like totally ridiculous. So they’re defending the shareholder’s interest, and the wages are getting lower and lower. We call that the race to the bottom. [43:05] So we’re making more people more miserable and more impoverished; so this is a huge issue for this country because we see a lot of South American and Central American nationals in the English nations being abused by the authorities in every country – for example Ecuadorians being abused in every single country until they make it, if they make it to their final destination – they’re being abused, with no rights at all. I worked in the United States for a while, and I used to tell immigrants that before they start walking to the United States, whatever they were going to get in the United States was already paid with the external debt – going to the hospitals, to the schools, we already paid for that. Don’t feel intimidated; you need to show this this year; medicine is not a benefit – it’s a right. And of course migratory status is a benefit; it’s not a right. If it’s up to them, that’s how they use health too, and education. And so you have to enforce that to the people, even before they leave we have to reinforce that because they are eventually going to start walking and they have to have that clear. It’s really a daily drama for most people who are desperate are trying to provide; and that’s why all this narco-business is like … for many because you try and try and try, so it’s easier to assault – so we have these levels of violence and these levels of being ripped-off, levels of crime; and also corruption – so many levels. From Wall Street down to stealing – it’s horrible. NM: Gangsters, exactly. Imagine that this guy, stealing millions and then asking for our taxes to be paid to this …. AK: And in El Salvador when people migrate, normally adults or the men, and quite often the younger people end up in gangs as a way of forming a social bond because their family has broken up. Is that happening here as well? I have adopted four kids like Angelina Jolie. One was from the refugee camps – he already graduated; he’s in Tijuana with his sister, and he calls sometimes and wants to come back here – he will be supporting Mexico in the refugee camp. Then I have another one who’s 21. He’s from another eastern state of Jutiapa where there’s a lot of poverty and battered women. And then another one, Kekchi, from that group in the northern area who was going to be a policeman, with the police for a while, then the army. Then I talked to the mother and said you can’t have this brilliant kid in the army. So he’s with me in my house. He plays the marimba, so I bought him a marimba. So he plays marimba and he is going to school. And another one who’s graduated already and who’s married. But I have a great four. We have to help this fabric of society – from the conflict to the economic, we have to help each other. Like in my house is like a cooperative – it’s a community there. So I can have a safety life where I get work in communities, a man won’t even have a job. Somebody has to support that lifestyle. So it’s like a community. So that’s the only way, I guess, that society is going to … But it’s not been an easy thing. We want to be artists; I like to be a poet, but you can’t be in this country because you have to patch a band aid here and there, and that’s in the workplace, always patching. So where’s the …, the beauty, the indulgence, all these other things that we as a society could be doing? [50:30] But I’m just warning you about all the mess that we get. I went with Vicky Carr – I don’t know if you know her from … in the UK. I was in the UK. I spoke in the Amnesty International building. AK: Is she from the WDM? She’s a trade campaigner. NM: Yes, she invited me last year because there was a bilateral meeting in Europe and they had some Latin American speakers. Someone went to Madrid; I went to the UK; others went to Belgium; and we had a discussion in Belgium and we went to the EU Parliament and we spoke to the progressive ones to help us, blah, blah, blah. I don’t know. We tried. But I think it needs a lot of work in Europe too, so there’s a lot more pressure in those governments. AK: So many people, I think, in Europe are unaware that these negotiations are even taking place. NM: Yes, they don’t even know. And also bringing more leadership from there to here so they can see first-hand – like more active. I definitely think that publications think they’re making things count more. AK: I just have one more question – I was just going to ask you about Plan Puebla Panamá because a couple of years ago – there’s a newspaper in England called The Guardian – and they wanted an article about Plan Puebla Panamá, especially about there was going to be a hydro-electric project there on a river along the border between southern Mexico and Guatemala. Then they were going to cancel it; and now I don’t know what the situation is because different people are telling me different things. But I was wondering if you know of any examples of hydro-electric projects in southern Mexico or in the northern part of Guatemala which are definitely going ahead? NM: Well we know that the Plan Puebla Panamá was so unpopular, they were going to have to change the name. And I don’t think they got hold of all the finance – it was so much money. But they started doing the Sistema de Integración de Centro América – that’s already going – that was at the end of last year. So that’s the connection with this country’s electrical system. But it obviously had to do with a lot more than just electricity, so they’re still working on this in Sololá, this area that I work in, in Alta Verapaz and Sololá, a huge dam. In the Río Usumacinta, there were going to be seven – a huge one called Lodomedio [???] – that was the first one to be. That alone will flood 750 sq km, like one third of the Petén where there are 700 minor sites – so it’s been very unpopular because that was only one of them and they were planning seven others for the Usumacinta River. AK: Did you say it was called Lodomedio? NM: I can show you the map. Lodomedio it’s not. It’s in Río San …?? ?… I can’t recall. But that’s the biggest one. … And the river divides Mexico from Guatemala. AK: Do you know what company it is? That’s going to build it? AK: Of all the work that you’ve mentioned in Alta Verapaz? NM: Today after I have talked to you I’m going to the printers because we’re taking a document to where my friend is going to be in the tribunals (courts) tomorrow. We have made a document and that shows where all these huge companies …?? ?… 1871 was when the coffee came with the German scheme. Then there’s another map with 1894 …er… 1944, the United Fruit Company; then another map with the 90s in: then another map. And all the log was from all these companies in these areas. If you can visualise the interests of all these companies in these maps. It’s easier if you don’t know how to read you can see this map and you can summarise – you see, the thing with us is that we have to give presentations to people who have never done this before and who don’t know how to read and write. And still I have to explain to them from corn to the WTO and everything in between. And I did that, from what you eat, from what you know to here. And I do these presentations and they have to be in a very visual way to explain that so that people can get it. It just depends on how you present it. NM: The Consejos are all over the country. AK: And where are you building this system? AK: In a specific community? NM: In all the communities that we work in. I work in an organisation that covers 13 communities, and in all these communities where the water is an issue – and the ironic thing is that these communities are along the river, the Cahabón River, but that river was a really changed course. So they just get dirty water, really dirty – they’re washing and drinking from that and the last time I was in a community a woman said “You know I’m not that ugly that I have to drink from this dirty pond”. She said it was sucio. I got sick from coming back from that. … We were there like 40 people for 3 days building a cistern, so we had to camp there in the community, and there was no water. So it was just very, very sad. AK: I wrote an article about that for children that can’t go to school. AK: Are you working with a production company? Or are you making it yourself? NM: I have made a YouTube three YouTube – three small ones – one 21 minutes long and these are going to be one on African palm, one on water, and one on the construction of the cisterns. Usually, there’d be a North American peace woman helper until … and we go on doing the shooting. Then I collect all the footage. We have lots of shooting edits with a friend of mine who has a company who has helped me. But shooting is ….